Piece originally published in The Huffington Post and on CNN iReport. Years ago, I was spending the night at my then-fiance's parent's house. He was my first love, and he was white. The next morning I woke up to his father's voice. He was in the kitchen, talking about how years before he had a big issue with black people. He was, in effect, admitting that he used to be racist. I let his comments slide, after all, he'd moved on from his hang ups and he'd always treated me with love and respect. But his comments stuck. Just like so many other comments and situations have stayed with me through the years. Like, the coworker who said it was unprofessional that I speak Spanish in our clinic (never mind that it's my first language, and a different co-worker needed help with her Spanish. And never mind that I need to translate for patients at times. Just. Never mind.) Or the bouncer at the club who made a comment about not letting us in because of us being black (and said so). Or the girl in high school who wore a t-shirt that read "You're in America. Speak English" (mind you, this was 10 years ago, but I still remember that darned black t-shirt). There was also the time, years ago, that I went out with my co-workers to a nightclub, and one of my coworkers made a comment about a guy smelling like BO, and my co-worker (who at the time I considered a friend) responded "what do you expect, he's foreign!" I also let this comment slide. Her and I got along great. But wait. I'm foreign. I didn't know how to process her comment. Did she think like this about all foreign-born people? I sniffed myself. No body odor over here, thankfully. Another one was the wealthy lady who joked about sending me to run her errands. After joking about giving me her errands list, she proceeded to say "I have to go pick up my laundry next, do you want to get it for me?" I made some lame joke about her running my errands, but inside I was fuming. I was on my lunch break, wearing my work scrubs (the cute, pastel ones at that) and my signature bun. I couldn't help but wonder, had it been a young white girl, wearing pastel scrubs and a bun, would she have joked about errand running? There's also one of my roommates, who was worried about me bringing "thug boyfriends" around. I didn't learn about this until just recently, but apparently he worried about my "thug boyfriends" immediately after meeting me. And I look back to the day we met. I was wearing high top converses and a bomber jacket, and yes, my bun. We spoke of my years growing up in Spain. We spoke of his years in France and my attempt at becoming fluent in French. He knew I worked at the college, and that I was a college student. What in the world about me screamed "thug"? Nothing. Except my skin color, of course. And situations like these just pile up in my life. One after the other, after the other. Fifty years ago next month, Martin Luther King delivered his infamous "I Have a Dream" speech. In it, he said "I have a dream that my four little children will one day live in a nation where they will not be judged by the color of their skin, but by the content of their character." Sadly that wasn't the case then, and it isn't the case now. Yet people refuse to see it, because they don't experience it, and because racism isn't as overt now as it was 50 years ago. The racism of today is hidden much better, displayed in a manner that makes people not necessarily pick up on it, unless it's something they keep experiencing over, and over again. There's a word for this: Micro-aggressions. According to Sue et al. they are "brief and commonplace daily verbal, behavioral, or environmental indignities, whether intentional or unintentional, that communicate hostile, derogatory, or negative racial slights and insults toward people of color." This happens constantly, no matter who the person is. Barack Obama was confused for a waiter just 10 years ago, when he was at an event in which he was one of the few black people in attendance. Lisa Price is the founder of the extremely popular beauty line Carol's Daughter. Carol's Daughter employs celebrities such as Mary J. Blige and Jada-Pinkett-Smith to advertise their products. They are not small potatoes. And yet, when she was on vacation not too long ago, a man approached her as if she was the maid. His friend told him she wasn't, to which he responded "why else is she here?" Micro-aggressions happen constantly to people of color, and they make the person at the receiving end feel less than, over, and over, and over again. It's as if we are being reminded, time and time again, that we are "other" and that "other" means lesser, not good enough, no matter what. So when people accuse people of color of pulling a "race card" or "race hustling" they don't seem to realize that our skin, our being, is pointed out to us and demeaned day in and day out. We don't pull a race card. We have it pushed upon us. Racism deniers insist that we live in a "post racial" society. They insist that we only imagine things like these, and that we are too sensitive. But they don't stop and think that since they are not the ones experiencing these situations, maybe they are blind to the fact that it's happening all around them. 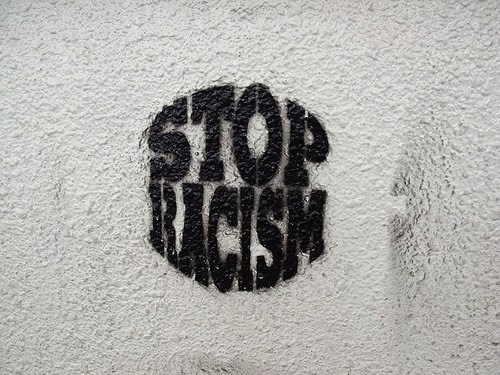 However, being in the age of information is making racism more visible. Some examples are what's going on at the Big Brother house right now, or the tweets people hurled at Sebastien de la Cruz and Marc Anthony, who although US born, people didn't find "American enough" to sing God Bless America. Or the fact that people were angry that Rue was Black in the movie version of The Hunger Games. But people still refuse to see it, or admit it. And because people don't want to acknowledge that racism exists, it's harder to fight it both on a personal level, and on an institutional one. For example, while whites are more likely to abuse drugs than African Americans, blacks are seen by the media and general public as criminals and drug users. Which in turn leads to programs like "Stop and Frisk". Which are aimed at minority youth. Which in turn leads to higher incarceration rates for black youth, for crimes their white counterparts are not even looked at for. Blacks also get longer and harsher sentences. Which in turn leads to more disenfranchised minorities. There's also proof that minority schools get less resources, which leads to lower educational opportunities for our youth, and therefore not as many opportunities down the road. And then there's the fact that employers are less likely to call people for jobs if their resumes have ethnic sounding names (think, Laquisha, vs. Lauren). 72,561 youth were interviewed for a National Survey on Drug Use and Health study, which was published on the Archives of General Psychiatry. The study determined that 9 percent of Whites had a substance abuse disorder, while 7.7 percent of Hispanics and 5 percent of African Americans did. However, 90 percentof those stopped for Stop and Frisk were Black and Latino. Also, "Blacks and Hispanics were three times more likely to be searched during a traffic stop than White motorists". Because of this, "1 in every 15 African American men and 1 in every 36 Hispanic men are incarcerated in comparison to 1 in every 106 white men." Blacks receive sentences that are 10 percent longer than that of their white counterparts, for the same crimes. On average, schools spend $334 more on their white students, than on their black ones. Applicants with African American sounding names are 50% less likely to get called back for an initial interview than those with white sounding names. Because of these issues, and many more, the scales are stacked against us. As minorities we have to fight tooth and nail to prove ourselves, and even when we do, we are looked down upon as the help, or criminals, or what have you. And so, when people insist that we are making a big deal out of nothing when it comes to race, and that race is no longer part of people's consciousness, they eliminate a chance for open conversation -- conversation that could lead to the change of a system that may no longer be separate, but it's still definitely not equal. Piece originally published in The Huffington Post. Finally I've found the related article..I want to write my college essay about the same topic and your article is really helping me..Thank you very much for sharing. I too agree on the fact that racism happens in all parts of the world and even there are people taking action against it, it is still not enough to remove the baseless fear from the heart of people and it is sad. In summary - the right fats in the membrane of your skin are the foundation to healthy and good looking skin.